This post is a part of Nicole Carman's mental health-related holiday post series, "Taking Care of your Mental Health during the Holiday Season." To see the post line-up for the previous and remaining posts in this series, please visit this page on Nicole's blog, Navigating Darkness. If you enjoy this post, please comment and consider sharing it on social media! Today we will be talking about getting through the holidays when you are not close with your family. Everyone talks about the joys of the holiday seasons, and the excitement for family time, but what about those people who aren’t close with their families? 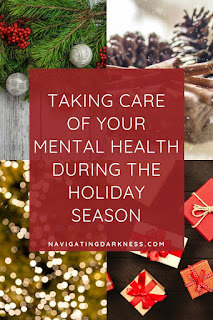 Those that feel alone, and get really depressed and anxious during the holidays? Unfortunately, some people just aren’t close with their families and may not have such good relationships with family members. These are the people who are often left out and feeling alone. Let’s first talk about how these people can get themselves through the holiday season: 1. Start a project: This can be absolutely anything! Some examples: maybe you are artistic. You could start an art project that takes a few weeks to complete, work on it a bit each day, it can make a really good distraction during the day. Musical? Write some songs. Dancer? Choreograph your very own dance routines. Acting? Write a script for a play. Writer? Write a story. Blogger? Write a blog series. It goes on and on! There is something for everyone! A project that takes more than a few days to complete is a good distraction, and if it’s something that you love doing, it’s a good way to keep a smile on your face during the holidays. 2. listen to music: create a playlist full of any upbeat music, songs that make you happy, and listen to that playlist as often as you can. Music has such a magical way of making our moods better. 3. Read a book: For those who enjoy reading, settling down with a nice cup of hot tea/chocolate/coffee and book of your choice, is a good way to help stay relaxed and calm. Books have a way of taking us away from reality for a little bit sometimes. 4, Limit social media: I recommend limiting how long you use social media because it can be harmful so it’s best to not be on it constantly everyday. How can you support someone who may be alone during the holidays? 1.Invite them: Maybe you can invite them out to do things with you! You may even be able to invite them over on Christmas, but if you can’t, that’s okay! 2. Check up: Check up on them throughout the day. Find out how they are holding up. - you can even send them positive and encouraging messages through the day. 3. Just be there: All you really have to do is be there for them. Make sure they know that you are available to listen if they need to talk. Make sure you let them know that you care and they can tell you anything. The holidays are not fun for everyone. When you are not close with your family, it is very easy to feel alone during these times. Focus on yourself, find a distraction that works for you, and be sure to keep in touch with your close friends. You will get through this, there is someone who cares for you!